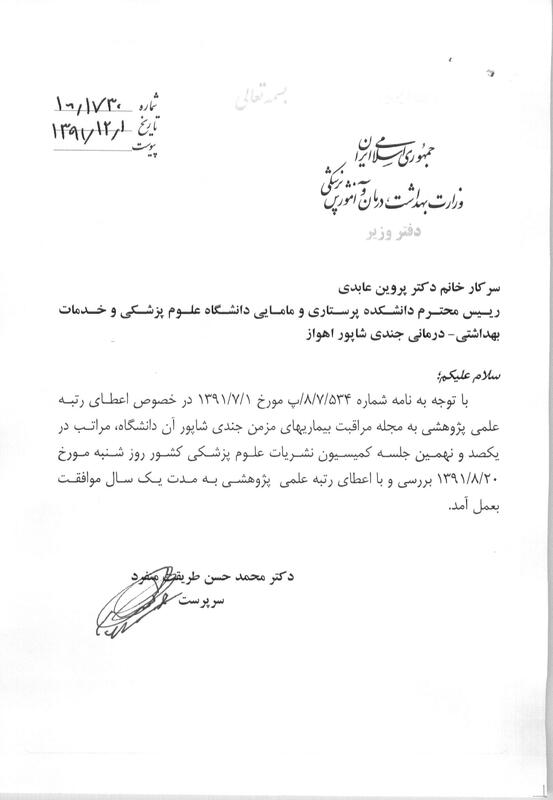 Minister's deputy office in press and publicity affairs of ministry of culture and islamic guidance according to certificate number 92/20530 on 27 Oct 2013 as international quarterly medical journal. 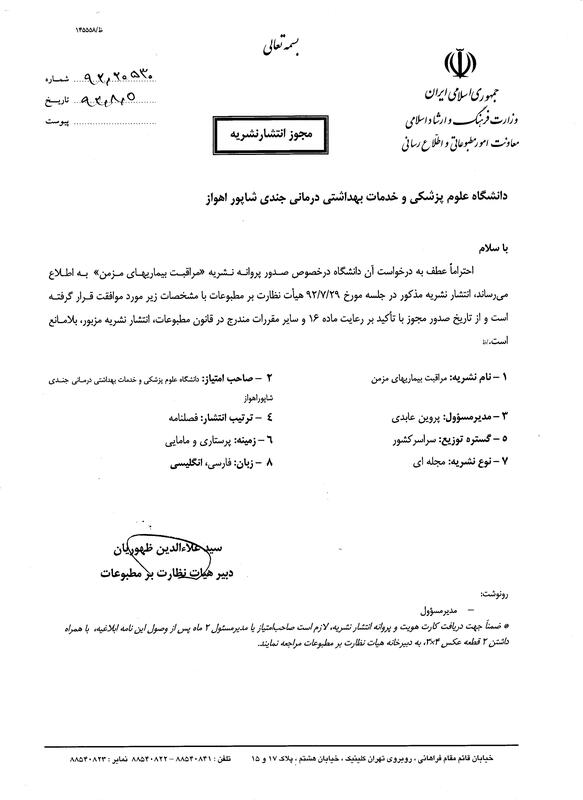 Minister's deputy office of Ministry of Health and Medical Education according to certificate number 700/654 on 28 May 2011 as an international quarterly medical journal. 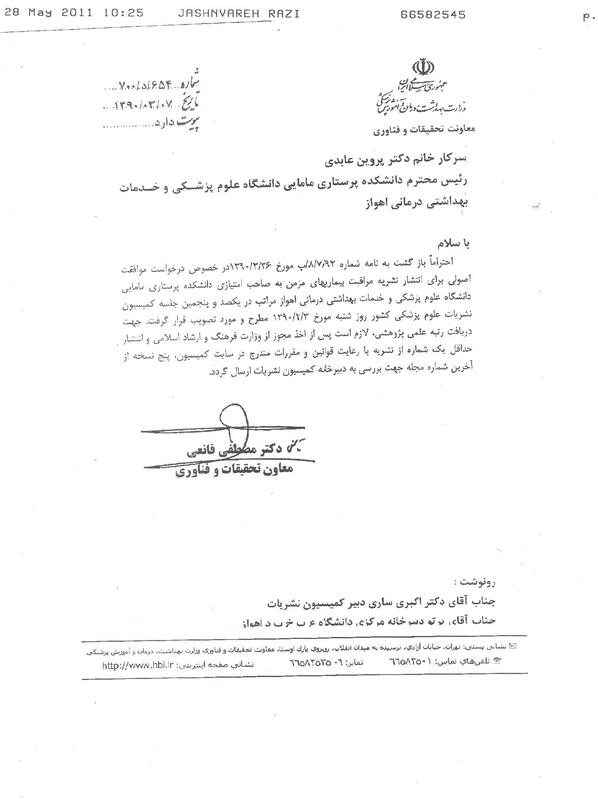 Scientific Research Approval The Iranian committee of medical science journals of the ministry of health and medical education according to certificate number 100/1730 on 19 February 2013 as scientific research medical journal. Aim & Scope Jundishapur Journal of Chronic Disease Care (JJCDC) is the official peer-reviewed research journal of Ahvaz Nursing & Midwifery School and is devoted to a wide range of research that will contribute on the chronic disease of the caring professions. Content Coverage Jundishapur Journal of Chronic Disease Care (JJCDC) is an authoritative caring journal which its content is devoted to the particular compilation of the latest worldwide and interdisciplinary approach and findings, including original manuscripts (quantitative or qualitative), meta-analyses and reviews, case reports, debates in the field of all types of chronic diseases. In addition, consensus evidential reports not only highlight the new observations, original research and results accompanied by innovative cares, treatment, and all the other relevant topics but also include highlighting chronic disease impacts or important clinical observations and letters on articles published in this journal. Article Processing Charge Jundishapur Journal of Chronic Disease Care does not receive any APC from authors and all article types are free of charge.